We can’t begin to express how much everyone’s love and generosity has meant to us during this time. As we’ve mentioned to a few people recently, the outpouring of love we’ve seen has brought us to tears far more than the devastation, which says more than words can. Through our GoFundMe Employee Relief Fund, we have raised more than we could have imagined to help employees and are absolutely humbled by everyone’s kind hearts! We will keep everyone posted as we learn more. We are working towards recovery immediately, but there is still much to be assessed on the island. Keep Anguilla in your thoughts! Please note that we increased our initial fundraising goal to $100,000. We couldn’t have predicted the kindness we’d experience, and are absolutely humbled by love towards Frangipani and its staff. There are many homes to be repaired, roofs to be fixed, windows and doors to be replaced, plus lives to help restore. Know that all donations are going directly to help Anguillian families in need! This entry was posted in Current Events & Activities. We’re still assessing damages at the hotel but are optimistic about our recovery. Much of our ability to continue to work after this disaster is because of the wonderful staff that we call family. We are sad to report that many Frangipani staff members have sustained severe damage to their homes, and some have lost theirs entirely. We have offered the hotel as shelter for employees that currently don’t have a home but are focused on helping them rebuild their lives. We greatly appreciate all of the love that we’ve received, and many of you have asked how to help. We have set up a Frangipani Employee Relief Fund and will work to help each employee rebuild their homes and lives. We are personally overseeing that these funds are allocated to those in need. For those wanting to contribute, we think that this is the most meaningful and impactful way, and we hope that you will share this with others who may be interested in donating. We are incredibly grateful to everyone who has reached out! Together we will make Frangipani and the island of Anguilla even greater. This entry was posted in Uncategorized and tagged Frangipani Beach Resort, Frangipani Beach Resort Anguilla, Hurricane Irma. Frequent visitors to the island of Anguilla wonder why the resorts and restaurants as a whole close down during the months of September and October. While the fall brings slightly warmer temps, it also means that you’ll have long stretches of beach all to yourself. A few restaurants remain open during the September/October period, but guests also have the option for private chef opportunities or the chance to grill in and enjoy their secluded getaway. New this season, Frangipani Beach Resort is offering our beachfront villa in Anguilla, with four ocean facing en-suite bedrooms, private pool, spa, washer/dryer and fully equipped kitchen during September and October for an option during the fall months. With the resort closed during that time, the villa will operate as a self-catering unit, but daily housekeeping service is available at an additional fee, and the tennis court will be available for guest use. Spacious kitchen, perfect for meals in or for a private chef in September and October. Interested? Email us at info@frangipaniresort.com or call us at 1 (877) 593-8988 or at 1 (264) 497-6442 for more information or to book your fall getaway on stunning Meads Bay! Read more about our beachfront villa in Anguilla. Frangipani Beach Resort’s beachfront villa can accommodate a maximum of 8 adults, plus 2 children. A five-night minimum is required in September and October, and the villa is available at a rate of $2000/night + taxes. This entry was posted in Current Events & Activities, Your Anguillan Getaway and tagged Anguilla Hotels, Anguilla Resorts, Anguilla Villa, Caribbean Beachfront Villa, Caribbean Boutique Hotels. 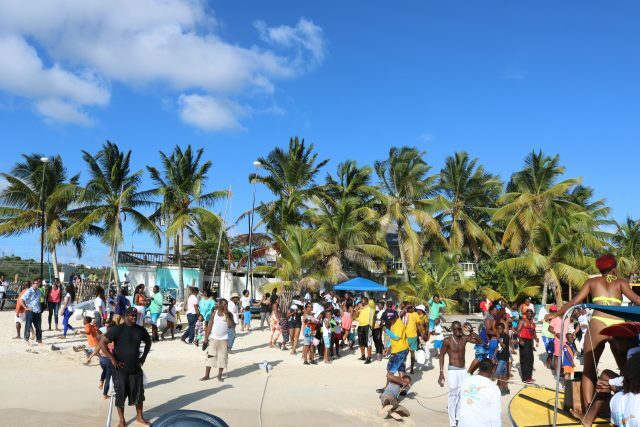 Anguilla Day celebrations cue the start of summer. May is winding down and June is beginning as we celebrate the anniversary of the 1967 Anguilla Revolution on May 30th. With the 50th anniversary upon us, this year has been extra special in the efforts the island has put in to celebrating the revolutionaries, island tradition and heritage. By the end of May, the weather begins to sizzle just a bit more; the seas sit calmly, perfect for days of boating and paddleboarding; and cultural festivities begin to come alive. 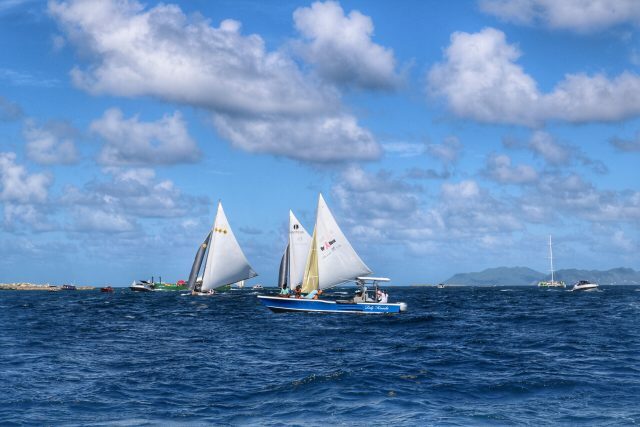 The Anguilla Day boat race is the kick off, and there’s no better way to celebrate than by being on a boat watching the sailboats pass by on their journey around the island. 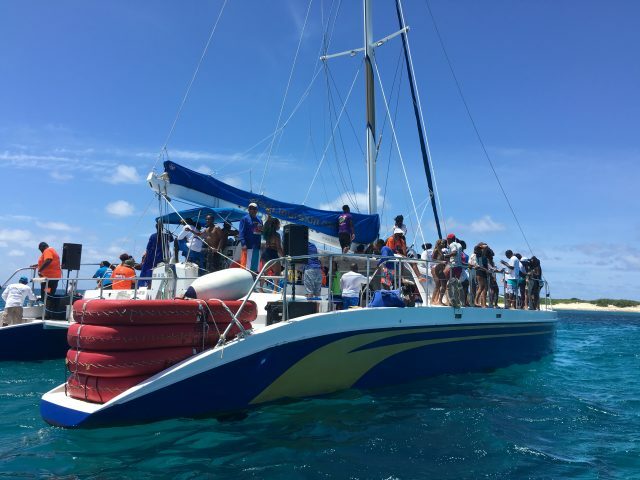 Loaded up with guests, we took FrangiCat on a spin around the island, departing Meads Bay and heading east to Little Bay, then onto Shoal Bay and Scrub Island before making our way around the southern side. We continued on, back to Sandy Ground where the races culminate in a beach party to celebrate the winners with island BBQ and music. 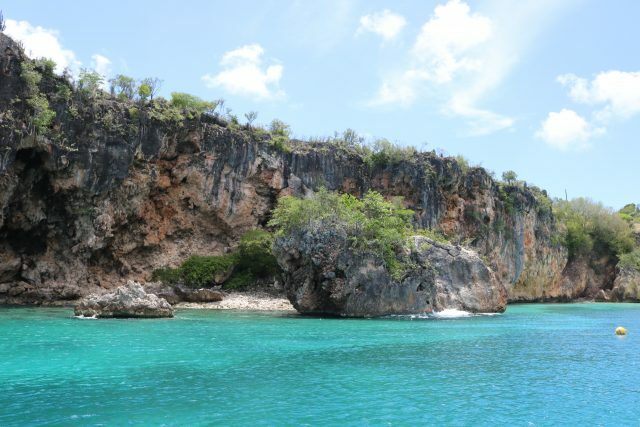 For us, no boat trip is complete without a stop at Little Bay, and it’s a place on the island that always stuns me with its beauty; the dramatic cliff side, the turquoise waters, and bright white sliver of sand the waxes and wanes throughout the season. 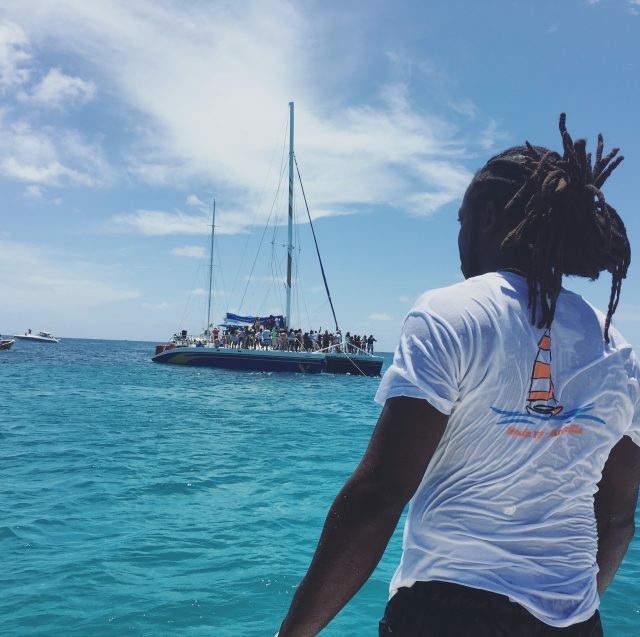 On Anguilla Day it’s not quite the calm oasis that it is most other days, but it still brings the natural beauty, complemented by soca music blaring from neighboring boats. For many of visitors and expats, it’s an excuse for a lively boat day. For locals, boat racing has cultural ties though and is part of the tradition of the island, dating back to early days of trading. As the island’s national sport, Anguillians are out en masse on racing days, watching boats zip by from the beach or from clifftops with binoculars in hand. 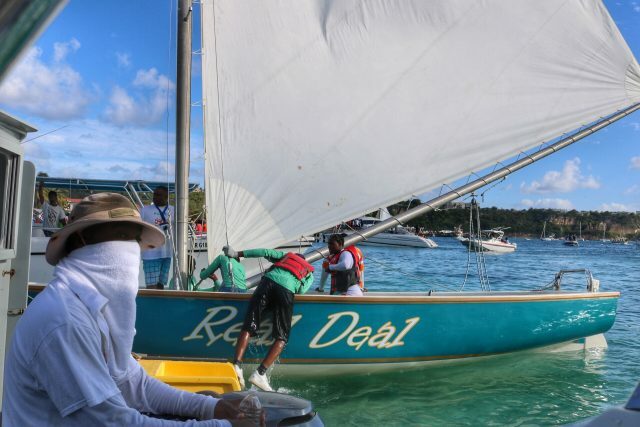 Most locals support a boat (there are few people here that we’ve met that don’t have a boat that they root for), and many organizations on the island help back a boat with financial contributions (you’ll see sails with logos on them, each boasting their sponsors). A huge congrats to Real Deal who claimed the win this go around! We’re excited for a summer of boat races and festivities ahead. The countdown to Carnival is officially on! 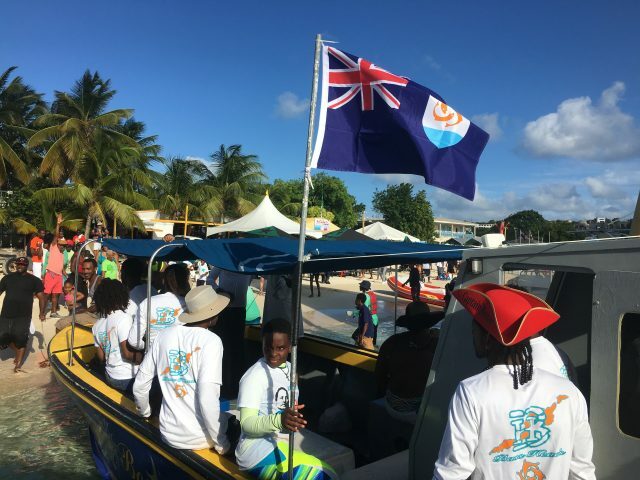 This entry was posted in Current Events & Activities and tagged Anguilla, Anguilla Events, Boat Race, Culture, Island Insights. We are honored to have been named Caribbean Journal’s Best Boutique Hotel in the Caribbean! Frangipani experience with one lucky winner! A handcrafted rum punch on arrival. Basking in the sun under our palapas. Taking in the sunset from the infinity pool. 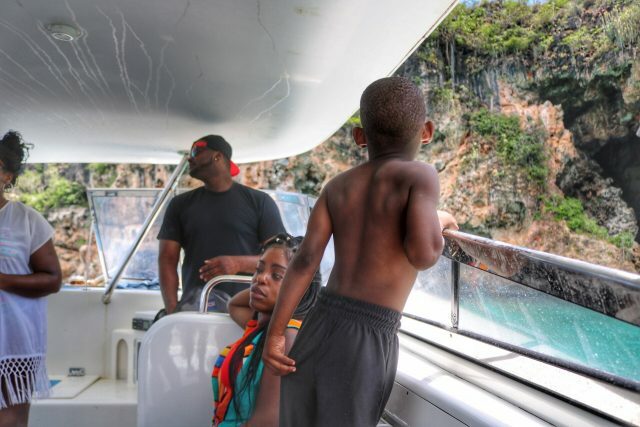 Jetting across the Caribbean on one of our beach hopping boat trips. Dancing to live music at the Pumphouse with Frangipani staff. All of our repeat guests have a special reason for returning to Frangipani and their own idea of what makes the #FrangipaniExperience a unique one. We want to hear from you! What do you think makes the Frangipani experience special? Head over to Instagram for your chance to win a four-night stay for two in a one-bedroom suite, complimentary locally crafted rum on arrival, a complimentary boat trip for two on the FrangiCat, and a half day sail aboard Tradition Sailing courtesy of the Tradition team! Upload a special photo from a stay at Frangipani with a caption that explains what makes the Frangipani experience special to you! Tag 3 friends that would enjoy a trip to Meads Bay, too! Haven’t been to Frangipani Resort before? You can still enter! Share a photo of the resort on your Instagram account with what intrigues you most about Frangipani. Feel free to regram snapshots from @frangipaniaxa or share any other photos from the resort that resonate with you! You can see more details on our website here. 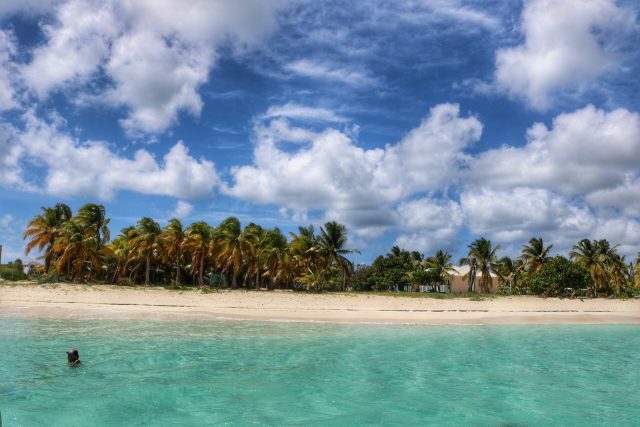 This entry was posted in Current Events & Activities and tagged @frangipaniaxa, Anguilla, Caribbean Boutique Hotels, Caribbean Giveaway, Frangipani Beach Resort, Giveaway, Instagram Contest. Frangipani Cocktail Party on Scilly Cay by Ben Killion. We’re all about finding ways to help our guests experience Anguilla. We have a privileged location right in the middle of gorgeous Meads Bay, but there’s so much to enjoy beyond our white sand beach and our collective goal is to help our guests discover which parts of the island resonate most with them. Many of our festive season guests have stayed at the hotel for years, with some visiting Anguilla for more than two decades in a row, yet many hadn’t moseyed on down to Island Harbour to visit Scilly Cay, one of our favorite gems on the island. In lieu of our traditional weekly cocktail party, we decided to up the ante with a cocktail party on Scilly Cay with hosted rum punch, rosé, and one of our favorite bands, Omalie360. We had a couple of musical guest stars – including a performance by one of our guests! – and plenty of fun had by all of our guests. We couldn’t imagine a better way to say goodbye to 2016! This entry was posted in Current Events & Activities and tagged Anguilla Beaches, Caribbean Boutique Hotels, Frangipani Beach Resort, Frangipani Managers' Cocktail Party, Luxury Boutique Resorts Anguilla, Scilly Cay. We’re honored to be named the Best Boutique Hotel in the Caribbean by Caribbean Journal! A huge thank you to all of our guests who took the time to vote and show their love and support for our family-owned boutique property. We love what we do here in Anguilla, and we’re glad that we’ve been able to share that love with all of you throughout the year. We look forward to continued success and more great memories to be made in 2017! 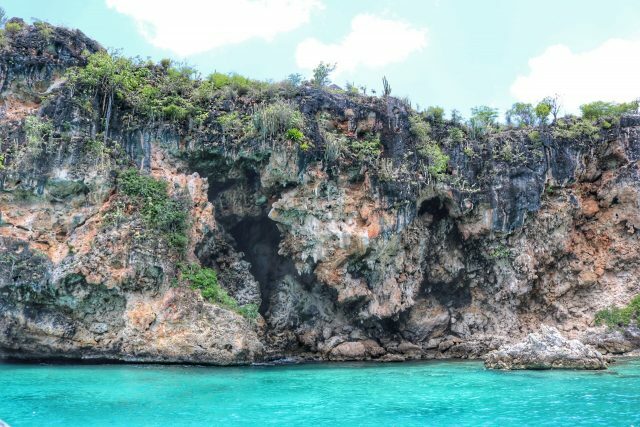 This entry was posted in Current Events & Activities and tagged Anguilla Boutique Hotel, Caribbean Boutique Hotels, Caribbean Journal. Frangipani Beach Resort is proud to unveil its new villa for the 2016/2017 season! Our 4 bedroom, 4 1/2 bathroom beachfront villa in Anguilla is the newest addition to our resort offerings. A stand alone property, it provides the privacy and intimacy of a villa with the added bonus of access to resort amenities and services including: concierge services, complimentary continental breakfast through Straw Hat Restaurant, complimentary water sports, signing privileges at Straw Hat Restaurant and Petals Boutique, use of our fitness center and tennis courts, and access to guest-only boat trips and charter opportunities. At roughly 5000 square feet, the villa occupies two floors, with four ocean facing bedrooms – two bedrooms upstairs and two downstairs – each with en-suite bathroom. All bathrooms are equipped with bathtub, indoor shower and outdoor shower for the ultimate vacation experience. A spacious downstairs living room, kitchen, and indoor dining area are part of the villa’s lower level. Also downstairs are two of the villa’s bedrooms and a half bath for shared use. Washer and dryer are available on the lower level as well. The kitchen is fully equipped with two ovens, two dishwashers, stove top and everything you’d need to prepare great meals at home. Alternatively, guests can chat with our team about hiring a private chef for a one-off dinner experience or an entire week of meals at home. Spacious kitchen – with ocean views! – perfect for meals in or for a private chef. Breakfast, lunch, and dinner service available through Straw Hat Restaurant. Upstairs, guests will find a living room/entertainment area equipped with a shuffleboard table and a large screen TV for communal use. The star of the show, however, is the view of Meads Bay from point to point. Enjoy sunset cocktails with Meads Bay’s best view! Also upstairs are two bedrooms, both with en-suite bathrooms. Additionally, there is a fifth room upstairs (no ocean view) which can be equipped with two roll away beds to accommodate up to two children. Frangipani Resort beachfront with the resort on the left and the villa on the right. For guests wondering where the villa is in relation to Frangipani Beach Resort, the photo above helps illustrate the privacy of the villa space but the close proximity to the resort for easy access to shared amenities. Learn more about our new beachfront villa in Anguilla on our website, or feel free to call us with questions at 1-877-593-8988. Inquiring about dates and availability? Reach out to us via phone or by email at info@frangipaniresort.com. This entry was posted in Current Events & Activities and tagged Anguilla Resort, Anguilla Villa, Beachfront Villa in Anguilla, Frangipani Beach Resort.